79% of online adults are on Facebook. And we all share incredible amounts of information about ourselves. Facebook compiles and organizes all of the data we share for their Ads’ platform so that marketers can go as broad or as narrow as they’d like. Consequently, Facebook offers unparalleled target options. This means you can create highly relevant ads that will appeal to the people you want to reach on a cost-effective basis. While Facebook continues to expand the variety of audience types available to marketers, check out our list of the top targeting options available now. Fans of your Facebook page. Right now the Facebook algorithm only shows posts to about 10% of your Page “likes,” which is why you tend to see that the reach is a lot smaller on an individual post than the actual Page likes on your Page. Fan targeting is a great way to make sure a key post has the opportunity to be seen by people interested in your brand. Friends of fans. This includes anyone that is a fan of your page and their friend groups. Geography. With this option, you can target by country, by state, by city, metro and by DMA – and any combination or group thereof. You can target by zip codes and radius areas around a specific address. Demographics. This option allows you to reach people based on just about any demographic configuration. You can target by Gender, Age, Education, Generation, Home, Life Events, Profession, Titles, and so much more. Interests. Including by types of posts users share on their timelines, apps they use and pages they like. The interests section has a nearly limitless number of options to choose from. You can search relevant topics or choose from a list of categories, each containing an abundance of subcategories. Behaviors. These are developed based on someone’s activity on Facebook, as well as offline activity provided by trusted third-party Facebook partners. Similar to interests, this option with Facebook has an incredible number of categories and subcategories. You have the ability to reach people based on purchase behaviors or intents, device usage and more. Target your own website visitors (you need to have the latest Facebook Pixel installed correctly on your site). Specific web pages, both targeting and excluding. For example, you can target someone who has visited certain pages but hasn’t converted. Email list segments, both targeting and excluding. You can upload your email list(s) into Facebook – this comes with a variety of identifier options. Time-on-site. This is another audience based on your Facebook Pixel. You can target people who have spent a significant amount of time on your site. Engagement on Facebook. You are now able to target based off of people who have engaged with your Facebook page, as well as a post, a lead ad or even video. Lookalike audiences. This feature allows advertisers to target individuals who mirror or look similar to former or already existing customers you may have. This audience option allows marketers to reach an entirely new group of potential prospects, identical to previously converted customers you may not have found otherwise. This can be applied to people who visited your site, CRM list, or those who have engaged with your Facebook page. Want to find out more about Facebook Ads and targeting options? (Or advertising on other social network sites?) Just contact us with a quick message. We have several clients who have had success using many of these Facebook targeting options. 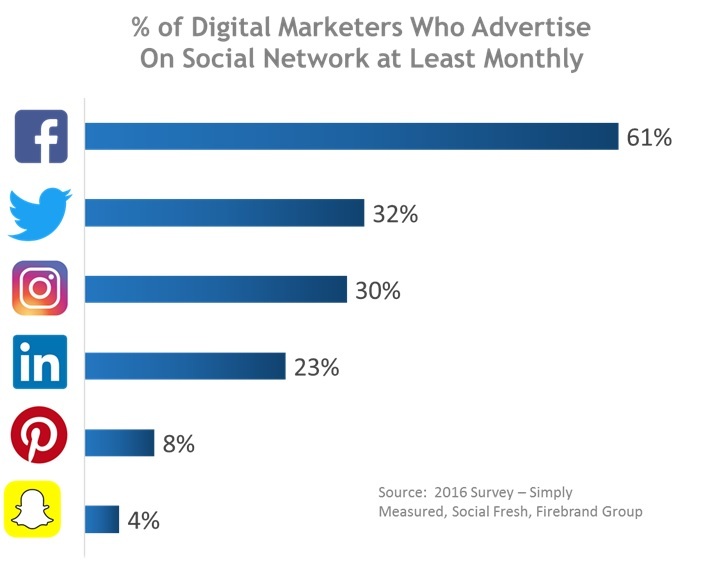 Instagram ads have been available to advertisers through the Facebook Ads Manager since late 2015 and Instagram is now typically included with most Facebook buys. By running your ad on both the Facebook placements and the Instagram placement, your ad will be optimized to show on the placement that gets you the most clicks to your website at the lowest cost. And, if you don’t have an Instagram account for your business, you can still run ads on Instagram. All you need is a Facebook Page. Your Facebook Page will serve as the voice of your advertisement on Instagram. ‹ Are Viewers Paying Attention to TV Ads?